Mesh drain cover is designed better with a built-in stopper. Now, nothing passes through the kitchen or bathroom sink to clog drainpipes. 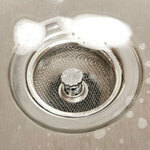 Stainless steel mesh kitchen drain stopper is on guard full time... when sink is full for washing or empty. Measures 3 1/4"dia., rim to rim.